You can get most of these plants at your local nurseries or even Home Depot or Lowes or Ebay. On my last trip I saw Home Depot stocked with many of these. 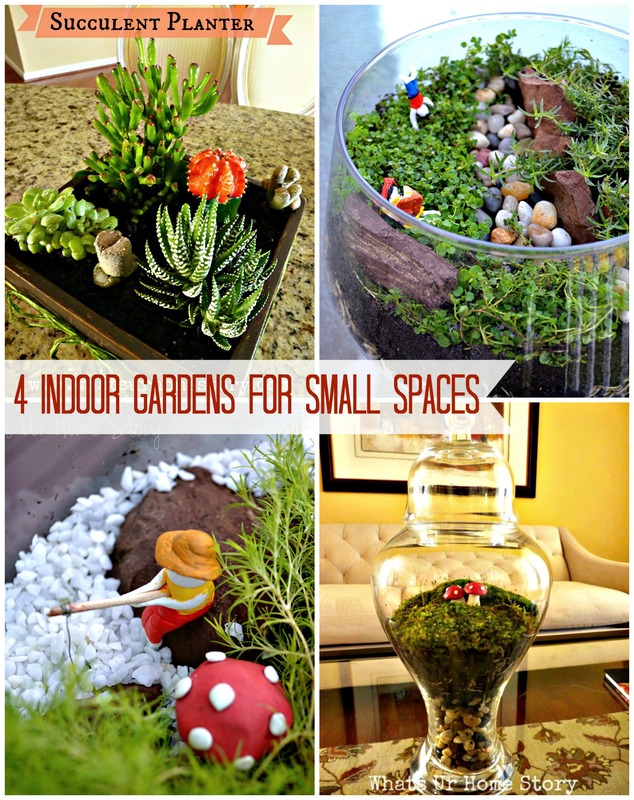 You could dress up these indoor gardens will polymer clay or air dry clay figurines, aquarium rocks etc. Depicting a scene is a sure fire way to turn these into great conversational pieces. Care wise, naturally succulents will be the easiest to take care off as they require only very little watering. Feel the soil and water ONLY if it is dry to touch. The other three, especially the open one on the top right need regular misting. Do you keep an indoor garden in your home? How has the weather been like in your area? Hey Vidya, Thanks again for inspiring me to go with some greens in my home. I tried looking for the air plant after your last post….but could not find any at HomeDepot or Lowes. I am going to give a last try succulents. Did you get them Reshma? If not you can find them online, amazon, Etsy, Ebay etc. Must try out the tray planter, and yes! I have an empty fishbowl in my home for the terranium. Thanks for the inspiration!! Oh yes, the fish bowl would make for a great terrarium. Would love to see it when it is done.